Department of Biochemistry, Rivers State University, Port Harcourt. HIV infection is one of the most prevalent infections in Nigeria. The high rate of transmission of HIV in Nigeria is of an immense public health concern. This study evaluated the levels of the antioxidant enzymes, superoxide dismutase and glutathione peroxidase in HIV positive subjects. A total of 173 subjects of age 20 to 70 years were involved in this study; 60 HIV positive patients on HAART (Highly Active Antiretroviral Therapy), 57 HIV patients who are HAART-naïve, and 56 apparently healthy control subjects. Patients who had severe malaria, tuberculosis or diabetes, were excluded from this study. Pregnant female subjects were also excluded. Five millilitres of venous blood was obtained from each subject by standard procedure. CD4 count was done using Fluorescent Activated Cell Sorter (FACSCount) automation, while the antioxidant enzymes, superoxide dismutase (SOD) and glutathione peroxidase (GPx) were determined using enzyme-linked immunosorbent assay (ELISA) technique. It was observed that HIV patients had significantly reduced levels of the SOD than control subjects, with HIV positive subjects on HAART even having lower levels than those who were not on HAART. However, there were no significant differences in the levels of GPx. The results indicate impairment of antioxidant function in HIV positive subjects. 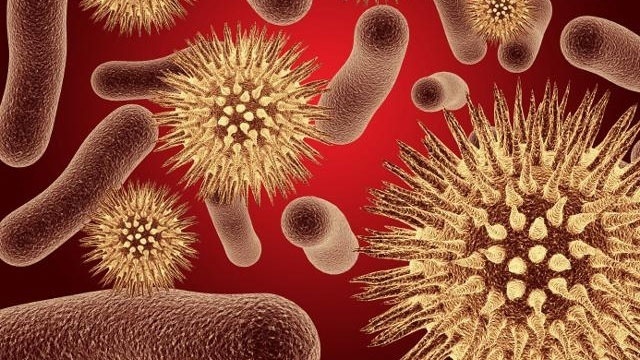 Inclusion of antioxidant therapies in the treatment and management of HIV infection may prove a useful treatment modality in ameliorating the negative health implications of a compromised antioxidant system in the subjects. The human immunodeficiency virus (HIV) is a retrovirus that affects the human immune system. Retroviruses constitute a large and diverse family of enveloped RNA viruses that use as a replication strategy for the transcription of virion RNA into linear double-stranded DNA with subsequent integration into the host genome (Chatterjea & Shinde, 2008). Chronic administration of Highly Active Antiretroviral Therapy (HAART) has been reported to induce metabolic disorders including insulin resistance. HIV drugs have also been reported to cause abnormalities in carbohydrate metabolism (Florescu & Kotler, 2007). For example, Protease inhibitors have been reported to cause glucose intolerance and hyperglycaemia (Mulligan et al., 2000, Savès et al., 2002). The human body possesses a system of antioxidants that co-operate to protect the cells of the body against the dangerous effects of oxidants. Antioxidant system consists of a variety of components, endogenous and exogenous in origin, which functions to neutralize free radicals (Krishnamurthy & Wadhwani, 2012) in the body. The human antioxidant system consists of both enzymes and non-enzymatic systems (Panda, 2012). Essentially, antioxidants are compounds that dispose, scavenge and suppress the formation free radicals or oppose their actions (Oguntibeju et al., 2009). They prevent or delay the oxidation of other molecules by preventing oxidative chain reactions. Antioxidant enzymes; superoxide dismutase, glutathione peroxide and catalase, are complex proteins that have minerals incorporated into their molecular structure (Kiefer, 2006). Antioxidant enzymes are often the first line antioxidant defence in the human body; they terminate the chain reaction of free-radicals by donating hydrogen or electrons to the free-radicals, thus, converting them to more stable products (Panda, 2012). All the cells in the body possess powerful antioxidant enzymes (Kabel, 2014). Superoxide dismutase (SOD) belongs to the group of oxido-reductases (Vaskova et al., 2012). It catalyses the dismutation of superoxide (O2-) to oxygen and hydrogen peroxide. The mechanism of dismutation of superoxide by SOD involves successive oxidation and reduction of the particular transition metal in the molecule of the SOD (Krishnamurthy & Wadhwani, 2012). Superoxide dismutase has been reported to be the most powerful natural antioxidant enzyme (Kiefer, 2006). Glutathione peroxidase (GPx) is responsible for protecting cells from damage due to hydrogen peroxide and lipid peroxides (Krishnamurthy & Wadhwani, 2012). It is an 80kDa enzyme that catalyses the oxidation of peroxide using glutathione substrate. This antioxidant enzyme contains a single seleno-cysteine (Sec) residue in each of the four identical subunits. L-selenocysteine is the most important amino acid at the active site of GPx, and is also responsible for the reduction of hydroperoxides, utilizing a tripeptide substance known as glutathione in the process (Alberto et al., 2010). This study evaluated the levels of superoxide dismutase and glutathione peroxidase in HIV positive subjects. This work was carried out in one hundred and seventy three subjects. One hundred and seventeen (117) were HIV subjects, sixty (60) of whom were receiving antiretroviral therapy while fifty-seven (57) were not on antiretroviral therapy. Fifty-six (56) HIV negative individuals were used as control subjects. The bio-data and medical history of the subjects were obtained using questionnaire. The subjects that participated in this research gave their informed consent, did not have tuberculosis, diabetes or severe malaria; those with any of these conditions were excluded from the research. Pregnant female subjects were also excluded from the study. Ethical consent was also obtained for this research study. Five millilitres of blood was collected from each subject; 2ml of this were put in a sample bottle containing ethylene diamine tetraacetic acid ( EDTA), for the assay of CD4 count, while 3ml were put in plain bottles for the assay of superoxide dismutase and glutathione peroxidase. The blood samples were centrifuged at 3,000rpm for 10 minutes and the plasma separated and put in another plain bottle. The plasma samples were then preserved at -20oC in the refrigerator prior to analysis. Analysis of the samples for superoxide dismutase and glutathione peroxidase was done using ELISA technique while Fluorescent Activated Cell Sorter (FACSCount) automation was used for CD4 count. The data generated was analysed using SPSS version 22. The results of this work indicate differences in the levels of antioxidant enzymes in HIV patients compared to the control subjects. SOD levels were significantly reduced in HIV patients than in control subjects. During HIV infection, there is enhanced oxidative stress due to activation of the immune system, which increases the generation of free radicals which results in the depletion in the levels of these antioxidant enzymes. The depletion is probably because they are consumed in the process of providing antioxidant defence in the affected subjects (Suresh et al., 2009). Therefore, HIV infection can cause a significant decrease in SOD levels in HIV-positive subjects. The levels of the antioxidant enzymes were lower in HIV patients on HAART than in HAART-naive HIV subjects. A similar results have been reported by other researchers (Kostyushov et al.,2009; Brown & Elechi-Amadi, 2016). HAART increases chemically reactive species in humans (Awodele et al., 2012), and has also been associated with increased oxidative stress in human HIV positive subjects (Ngondi et al., 2006). Thus, antiretroviral therapy exerts a negative effect on the activities of antioxidant enzymes. 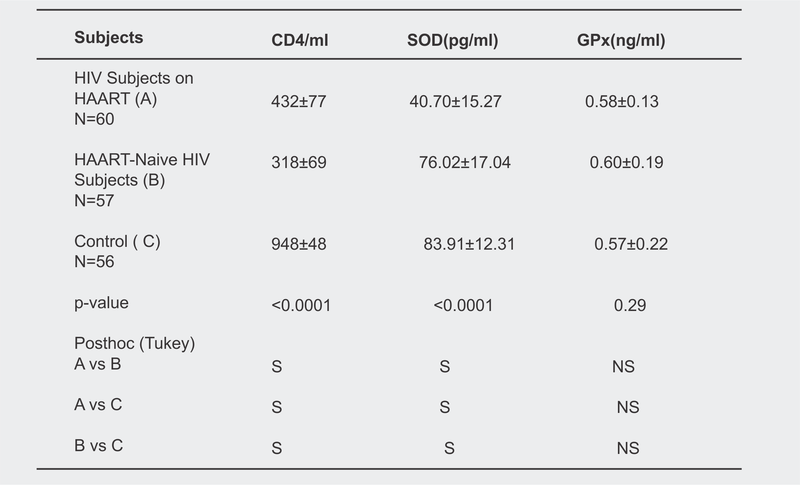 It was observed that the levels of GPx in HIV subjects did not significantly reduce compared to the control subjects. This finding agrees with the work of Kim et al., 2015. This is may be due to the synthesis of a selenoprotein that has significant homology to mammalian GPx by HIV (Zhao et al., 2000). Alterations in the levels of antioxidant enzymes have been reported in different disease conditions (Gil et al., 2003). HIV patients suffer constant oxidative stress, and this can lead to malfunctioning of the antioxidant system in these individuals. This study has shown that HIV patients suffer significant oxidative stress. There is impairment of the antioxidant defence mechanism in HIV patients, and this is further affected by drug therapy used in the management of the condition. It may prove useful for treatment of HIV infection to include antioxidant therapy. 1. Chatterjea, M.N & Shinde, R.(2008). Textbook of Medical Biochemistry. New Delhi. Jaypee Brothers. 2. Mulligan, K., Grungfeld, C., Tai, V.W., Algren, H., Pang, M., Chernoff, D.N., Lo, J.C. & Sehambelam, M. (2000). Hyperlipidaemia as insulin resistance are induced by protease inhibitors independents with HIV infection. Journal of Acquired immune Deficiency Syndrome, 23, 35-43. 3. Savès, M., Raffi, F., Capeau, J., Rozenbaum, W., Ragnaud, J.M., Perronne, C., Basdevant, A., Leport, C. & Chene, G. (2002). Factors related to lipodystrophy and metabolic alterations in patients with HIV infection receiving HAART. Clinical and Infectious Diseases, 34, 1396 ? 1405. 4. Florescu, D. & Kotler, D.P. (2007). Insulin resistance, glucose intolerance and diabetic mellitus in HIV-infected patients. Antiviral Therapy (London), 12, 149-162. 5. Krishnamurhthy, P. & Wadhwani,A. ( 2012). Antioxidant enzymes and human health. In El-Missiry, M.A( Ed.). Antioxidant Enzymes. Croatia. InTech. 7. Panda, S.K. (2012). Assay-guided comparism for enzymatic and non-enzymatic antioxidant activities with special reference to medicinal plants. in El-Missiry, M.A.(Ed.). Antioxidant Enzyme. Croatia. InTech. 8. Kiefer, D. ( 2006). Superoxide dismutase: boosting the body?s primary antioxidant defence. Life Extension Magazine,6, 73-78. 9. Kabel, A.M. (2014). Free Radicals and antioxidants: role of enzymes and nutrition. World Journal of Nutrition and Health, 2(3), 35-38. 10. Vaskova, J., Vasko, L., & Kron,I. ( 2012). Oxidative processes and antioxidative metaloenzymes. In El-Missiry, M.A(Ed.). Antioxidant Enzymes. Croatia.InTech. 13. Kostyushov, V.V., Bokal, I.I. & Petrov, S.A. (2011). The study of activity of blood antioxidant enzymes in HIV infection. Biochemistry (Moscow). Supplement series B: Biomedical chemistry, 5(2), 193-196. 15. Ngondi, J.L., Oben, J., Forkah, D.M., Etame, L.H. & Mbanya, D. (2006). The effect of different combination therapies on oxidative stress markers in HIV infected patients in Cameroon. AIDS Research and Therapy, 3, 19. Antimicrobial Resistance and Beta-lactamase Detection in Staphylococcus aureus isolates from Human Sources in Port Harcourt, Nigeria.